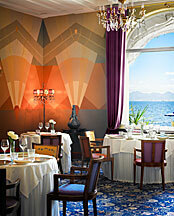 Hôtel Belles Rives*****, Juan-les-Pins, France. The talented Chef chefs of restaurant "La Passagere" produce meals filled with the tastes of the sea and la Cote d'Azur in this lovely restaurant that has one of the most glorious sunset dining views on the coastline. 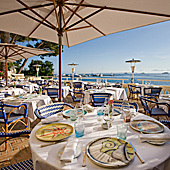 The restaurant "La Passagere" is part of the 5 star "Hôtel Belles Rives*****", newly renovated, in glamorous Juan-les-Pins on the Cote d'Azur located right on the very edge of the sea. 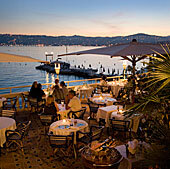 The exterior dining terrace is drenched with sun during the day but at night and in the evening, is filled with the last rays of the sun as it sets across the Golfe Juan making a memorable eating experience. 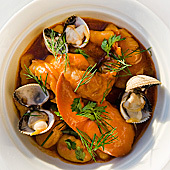 The menu is filled with dishes that combine both the cuisine of the Cote d'Azur as well as influences from Nice and Italy and other Mediterranean coastal spots. Like many restaurants today, it is constantly reinventing itself welcoming in the tastes of Provence blended with other Mediterranean influences to produce endlessly new tastes and combinations. We our meal started with a long, skinny dish of Amuse Bouche just to get the palate started. One was a glazed globe of foie gras on a round of toast accompanied by a small deep fried ball of fish puree in a carrot sauce. We moved on to a second little starter of a Tartar of Salmon served in a small shot glass with a cap of citron and dill cream. Our appetite thus stimulated, as though it needed to be, Peter enjoyed the Lobster in a delicate tomato sauce served with chilled gnocchi and tiny cockles while Linda had the Vegetarian squash, sweet pepper and tomato stuffed with a duxelle in the style of Nicoise cookery. For the main course, we both had the "Loup" or "Bar", which is also known in English as Sea Bass, served with a tempura of truffle instilled artichokes in a shell of polenta. By this time the sun was just a memory of light across the bay. The neckless of lights lining the shoreline around the bay came to life and the candles on our table took over with just a little help from the fading twilight in the sky. Dessert arrived in the form of small Baked Alaska but in the shape of a Bouche Noel. This was followed, just in case we still had some room, with a tray of post-dessert goodies - there was a thimble of Cream of Apricot, a Pistache cookie and a red mound of raspberry topped with a sprig of gold leaf on a tile of chocolate cake. We made the most of the fabulous weather. But when nature decides to be contrary or in the off season, the stately interior of the hotel's restaurant "La Passagere" was restored from old photographs. As a tribute to Provence craftsmen, the glassblowers of near by Biot that created the shiny pieces of blue, yellow, green, red glasses that enhance the colorful warmth of the room. In a country where dinner is the event of the evening, this delightful experience was one we will remember.